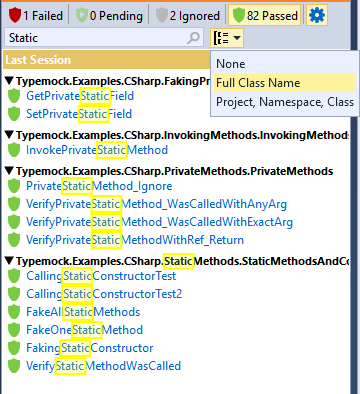 If you selected to group tests by the full class name or project, namespace, or class name, you can run all tests within the group in one click. 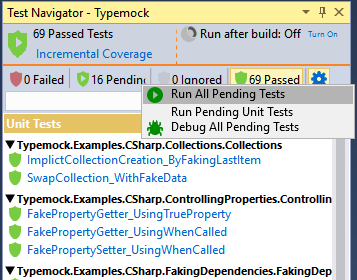 In addition, you can run all tests on the selected tab in Test Navigator. 1. In Test Navigator, click the tab on which you want to run tests. 2. From the filter displayed on the right from the Search field, select how you want to group the tests on the tab. • If you want to run all tests on the tab, right-click on the tab and select the required action. 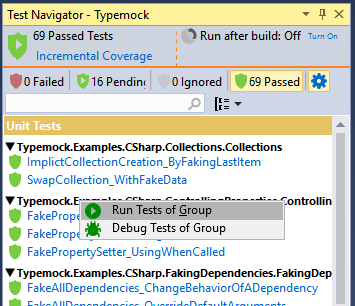 • If you want to run tests within a specific group on the tab, right-click on the group and select Run Tests of Group.